After the fog of the decongestants finally started to lift this morning (I hate the colds that come with this time of year) I realized that I forgot to post this yesterday. Bad girl! So here without further ado is my "J" post... a day late and a dollar short. J is for Jigglypuff, my absolute favorite Pokemon. Mostly because I think the ability to put things to sleep is just awesome. Also, look how cute that thing is, don't you just want to hug it? If you played Pokemon than you know these things were pretty hard to catch (or maybe that was just me) as they can mesmerize their opponent with those huge eyes and then sing a lullaby to put them to sleep and well of course your now sleeping pokemon is useless to you. 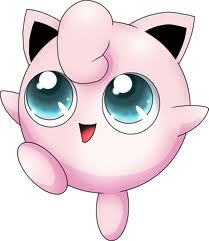 Jigglypuff is a balloon type Pokemon found in grasslands, meadows and is indigenous to almost everywhere. It's pre-evolution is Igglybuff which evolves into Jigglypuff when it reaches a certain level of happiness (can we all go Aww!) 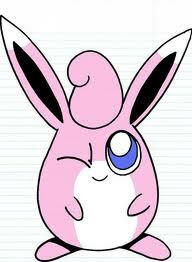 Jigglypuff evolves into Wigglytuff when it is exposed to a Moon Stone. Jigglypuff is a fairy and normal type not a balloon type. Know your facts.